There was more than a little speculation that suggested Apple may go after the same market currently being targeted by Microsoft’s Surface tablet. Well Apple didn’t exactly deliver on that during today’s launch event, but they did release a new MacBook model that may not be a tablet –but it does further blur the line between function and portability. In a design dictated by the width of the keyboard (which is full-sized, thankfully… and been re-invented to include a single LED beneath each larger-surfaced key to illuminate them nicely, and adds a new butterfly mechanism making key presses elegant and more deliberate), this new MacBook weighs in at only 2lbs and is a slight 13.1mm thick (the MacBook Air by comparison, is 17.3mm thick). No detail was left un-touched: the 12-inch Retina display boasts using 30% less energy without losing any brightness, features the amazing pressure-sensitive Force Touch trackpad (that can tell the difference between a light tap an a deep press), is the first fanless Macbook (which saves space and means the notebook runs in complete silence), features custom-shaped batteries that maximize space and promise to deliver up to 10 hours of battery life, and comes equipped with a USB-C port (that lets you connect power, USB, DisplayPort, HDMI, and VGA all in the same place –by way of additional converters available to purchase, which is the only unfortunate part). 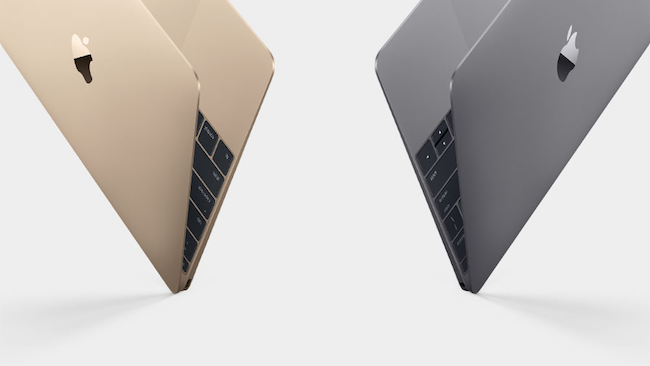 The new MacBook starts at $1299 and comes in an array of beautiful colours (silver, space gray, and gold), and is available for shipping on April 10.